Some dogs have been saved from the slaughterhouses today in Yulin, China. Below, I have posted this article. Please visit the and bookmark Investvine to keep up to date on trending events and business news in Asia. An annual dog meat-eating festival held in a remote part of southern China has once again sparked an international outcry, with a petition to stop it now circulating on social media. For the second year in a row, the Yulin dog-eating festival, which coincides with the summer solstice, has come under fire by animal activists, who report that 10,000 dogs will head to inhumane slaughterhouses on June 22. Many of the canines, the campaigners claim, are strays or stolen pets, evoking health concerns, and will be subject to cruel treatment for the sake of traditional medicinal superstitions and flavour enhancement. But while the social media-propelled petition is new (see the #stopyulin2015 hashtag on Twitter), the practice of eating dog is far from it. Dog meat has long been a part of the Chinese diet, dating back thousands of years. The revered Confucian scholar Mencius wrote circa 300 BC of the “three beasts” of common food: pigs, goats and dogs. Connoisseurs of the taboo dark doggy meat call animal rights campaigners hypocrites for elevating one species for consumption, while breeding others for slaughter, such as chickens, pigs, cows and fish. It’s a sentiment that some consider pretentious, and not only in China. An international taste for dog still thrives. South Korea, Vietnam, Indonesia, India and Western African nations continue a culture of eating dog today. And certainly, to Indians, the protests must appear condescendingly blind, for no such backlash has ever been sparked by the mass consumption of beef in the West. 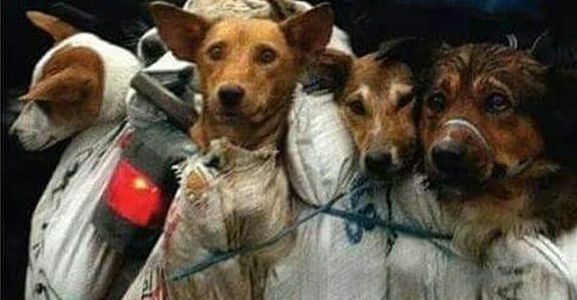 Yet, the global consternation seems to come more from the grotesque methods that are being used to cull the dogs; pictures appear showing them straggled, boiled and blowtorched alive, and having their necks slit on filthy streets. China does not have any animal rights laws to discourage such displays of cruelty. The closest the country ever came to that was in 2009 when a draft law was proposed that would charge abusers with a 6,000 yuan ($966) fee and two weeks detention, but the National People’s Congress has yet to approve it. This could be because in China, old traditions die hard. The Yulin Summer Solstice Lychee and Dog Meat Festival (the event’s formal name, which includes a pairing with Lychee wine) takes place in a forested and remote area of the Guangxi Autonomous Region, one of the poorest parts of the country. Here, the days when life was threatened by famine is only a generation away. During China’s Great Leap Forward, a disastrous three-year episode from 1958 to 1961 following the collectivisation of China’s agricultural sector that resulted in one of the world’s largest famines, Guangxi, the most ethnical diverse part of China, suffered greatly. And when food was rare, older traditions took on new importance, as survival became an immediate issue. The acceptance of antiquated forms of food is especially true in China’s south, which has a reputation for having a varied palate. “The southern Chinese,” a common adage goes, “will eat anything with two wings that flies, except a plane; anything with four legs, except a table.” This open indulgence in exotic meats makes the diets of southern Chinese akin to that of bush meat, eaten in parts of Western Africa. But what makes the Chinese breed of dog dishes so distinguishable – and, indeed, horrifying – is the traditional belief that meat tastes better when cooked alive. This crude recipe originates from ancient Chinese lore and, thus, isn’t only subscribed to by the Chinese. Koreans have, for just as long, enjoyed eating food while its still alive: san nakji, a small octopus, is a popular local dish and can be eaten straight out of water tanks in South Korea. South Korea is, however, much more humane in its consumption of dog meat, developing a first-world industry by raising a breed of yellow dog into livestock. Similar to the Chinese, those on the Korean peninsula – both north and south of the DMZ – traditionally eat dog during the wintertime, prepared in a soup called boshintang – or “healthy soup.” Men are especially drawn to this seasonal delicacy; it is said to be a potent medicine to improve virility, with up to 2.5 million dogs slaughtered in South Korea every year for food, compared to the 20 million eaten in China. But the online ire against Yulin online has emanated mostly from the West, where the domesticated canine is considered “men’s best friend.” Since before written history, men have used dogs as pack animals, to herd and track; eventually, in the West, the two species formed co-habiting bonds. European cultures later bred dogs for protection and came to depend on them for exploration in the wilderness. Dogs developed bite-inhibition behaviour and could be trained – if a dog owner got lost or hurt, the dog proved a lifesaver by learning to search for help. Such relationships of camaraderie and rescue were, however, unique to the West – and in many ways still are. Those who plan to revel in the Yulin festival grumble that the protesters’ double standard of dogs does not justify stopping the event, even though local officials have publically said that it is illegal and has been canceled. Animal rights campaigners see this as a blatant lie. “Mass dog slaughter is still going on at Yulin despite the local authorities trying to give the impression that’s it’s ended,” Peter Li of the Humane Society International told the Daily Mail. “The Yulin government has declared the ‘festival’ will not happen, but this is mere semantics and thousands of dogs will still die for their meat whether it’s called a festival or not,” he added. Local protesters have also voiced their displeasure of the brutal treatment dogs are subjected to in Yulin, and internal debate over the fate of the animals has at times boiled over. Before last year’s festival, fights broke out at restaurants in Yulin that serve dog meat, according to Chinese media. For two years, a lone woman has spent thousands of dollars buying dogs in Yulin to save them from the butcher’s blade. Last year, Ms Yang Xiaoyun, 65, saved 350 dogs, as well as dozens of cats, spending about $24,000. China’s lack of animal rights laws, indifferent law enforcement and strong traditional history don’t bode well for swift change in practices carried out at the Yulin dog festival. Activists would be more effective to shake off the shock of seeing mirror images of their household friends killed for consumption and instead take up arms against the unsanitary and unregulated meat industry that still prevails in many developing nations. Not long ago, an industrialising West was also guilty of cruel slaughterhouse tactics. In Upton Sinclairs The Jungle, a book he wrote about the meatpacking industry in Chicago during the early 20th century it wasn’t only the animals that were thrown into nightmarish conditions, but also humans. And, like the Chinese, we were not finicky with what we were eating.